Candlesticks in trading can be too complex to grasp. This is why it is not quite advisable for novices but still has to be learned at some point. When it comes to analyzing candles you need to put a lot of focus towards it. Now, let’s talk about the concepts that are vital in Candlesticks for binary options trading. Let us first talk the Engulfing Pattern. The name sort of speaks for itself. 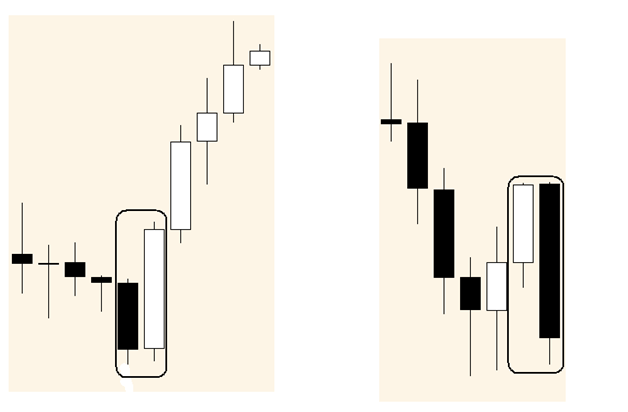 A valid engulfing position is when the 2nd candle completely surrounds the body of the first candle. Bullish engulfing forms out of a bearish candle that is succeeded by a bigger bullish candle. 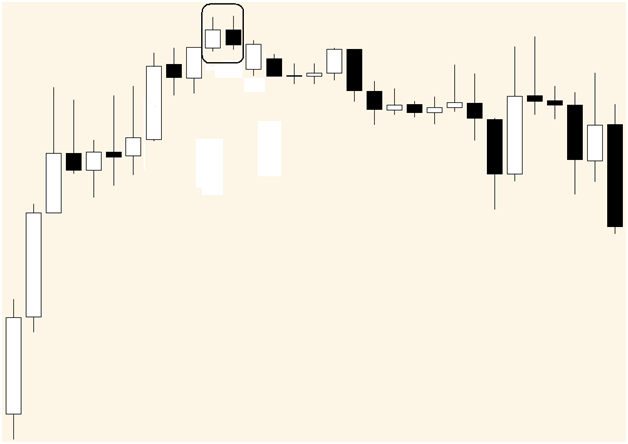 Bearish engulfing forms out of a bullish candle succeeded by a bigger bearish candle. You can see a bullish pattern once there is a downward movement or a consolidation period. It shows that the bulls can be quite strong to begin controlling the market. This strength can be seen through a huge, engulfing candle. 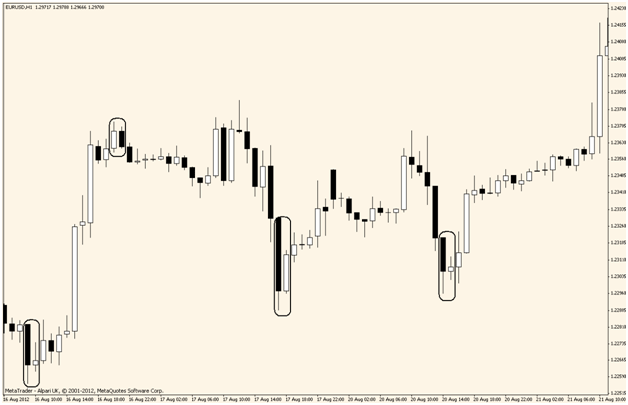 There are times when the 2nd candle engulfs one or more candles before it. When this happens, you have to pay attention because this is a stronger signal. You can also apply this principle to bearish engulfing patterns. You will often see a retracement that ends with engulfing formation and this may be an ideal time for you to join the continuing trend. On the left side we see uptrending pattern and on the right we have the downtrending pattern. This is a double candles trick formation. 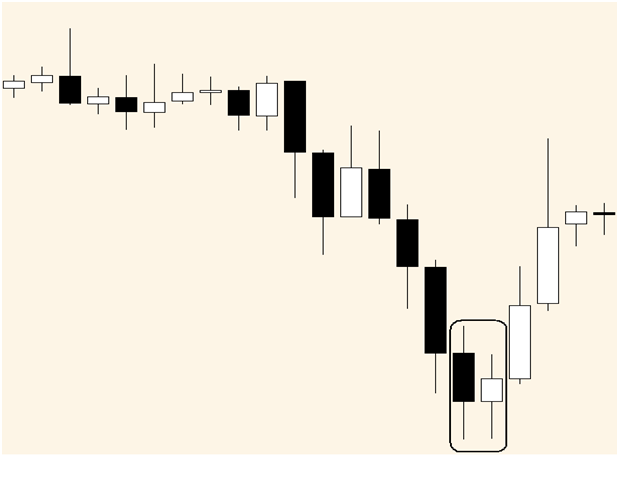 The inside bar forms if the 2nd candle has Close and Open inside the first candle’s range. It is almost the reverse of the engulfing pattern. You will notice that the inside bar or second candle in the formation comes with the Close and Open in the first candle’s range. This is called the Mother Bar. You will see inside bars in either a downtrend or up trend. There are no important requirements like Tweezers. Often times, one inside bar may follow the Mother bar. This allows additional signal strength but this is not typical situation. You will see a Tweezers pattern when there is an extensive in whichever direction. Tweezer tops appear when there has been an extended upward move or an uptrend. The primary candle has to match with the major trend or the newest move. This is a bull candle. The second candle will be an opposing trend candle. This is the bear candle. However, the two must go through the same highs. When this candle formation is completed, there is price reversal and downward movement begins. Moreover, Tweezer Bottoms is the exact opposite of the Tweezer tops. It shows when there is a down trend or extended downward movement. The first candle has to match the major trend. This is the bear candle. The second candle is the counter trend or the bull candle. But they will have same lows. Tweezer tops and bottoms show strong resistance and support. It provides us a hint that there will be a level hold and price reversal. The end of the trend can be marked. The start of the retracement and reversal or the retracement end can also be marked since they are patterns of reversal. Another vital aspect is Tweezer tops and bottoms can seem different but the order has to be the same – the trend candle then the candle trend and the test for the same low and high. WHY ARE THE DOUBLE JAPANESE CANDLESTICKS BAD? It’s actually hard to memorize a candle shape. This means that you will have a double trouble. The patterns shown here are the easiest to take note and memorize. However, even newbies can have terrible headaches. Similar to any tool out there, the Japanese candlestick formation has to be alongside other price direction indications. It also needs to have a sturdy fundamental awareness. WHY ARE THE DOUBLE JAPANESE CANDLESTICKS GOOD? When your eyes are used to identifying the formations on the chart, these formations can be more precise than the single candle sticks. This is used together with the major trend. They can provide more profit as well as more enhanced market knowledge. It is evident that trends are made up of retracements and lower lows and higher highs. Your best entry is the retracement’s end. Japanese candlestick formations can recognize that point along with higher probability degree. Thanks for all your labor on this web page. My aunt delights in getting into research and it’s easy to understand why. I learn all about the lively ways you provide both interesting and useful thoughts via your web site and as well as improve participation from people about this idea plus my daughter is in fact being taught so much. Enjoy the rest of the year. You’re the one carrying out a very good job.